I have loved this score since first hearing excerpts from it years ago, and always wondered why, once popular, it’s fallen into such neglect. Watching it I can see how it’s somewhat simplistic (and despite the requirement of staging a spectacle in the form of a man-made disaster, static) story could keep modern audiences away. Nonetheless, Lalo’s score is one of incredible beauty, some wonderful orchestral effects and some powerful choral music and ensembles. One could (and generally does) get much worse. I know little of the opera house of Opéra Royal de Wallonie in Lieges, but it is a beautiful, traditional house – and they have one hell of an orchestra. Indeed, the young maestro Patrick Davin, leads an entirely thrilling performance from the pit, beginning with a Wagnerian-length (and seemingly Wagnerian inspired) overture running to around 12 minutes. The playing from what seems to be a band of mostly youngish players, has a fullness and depth of sound that the Dynamic engineers capture brilliantly, particularly the long theme for the cellos and the rhythmically tricky work for brass that reoccurs throughout the score. The production by Jean-Louis Pichon is gloriously old-fashioned – in an old-timey, Victor Book of Opera sort of way. A basic unit set comprised of massive, jagged stones embanking both sides of the stage, locations defined by changes in the rear wall, creating rooms within and a plaza before the palace, the town square, the outskirts of the city, and the levees of the flooded city, all aided by an excellent lighting design. In a work known today primarily for its coupe-d’theatre of creating a flood onstage, one has high expectations for what technology can do. To his credit Pichon keeps it simple, dry ice creating the effect of water pouring over the city steps, and what appears to be “real” rain, falling from the sky before the villainess’ redemptive hurling of herself into the waters to save the city. 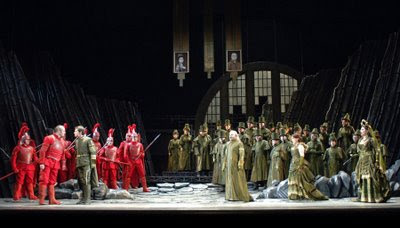 There are problems the Opera Royal de Wallonie production: singing is inconsistent, the chorus variable (literally ranging from excellent to groan inducing), the action sometimes even more stilted and static than the libretto calls for, missed opportunities. 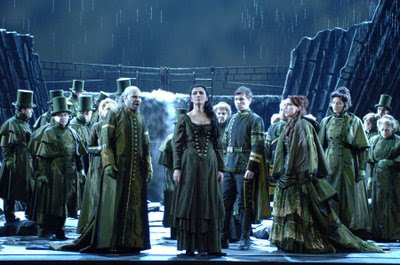 For instance, this is an opera where passions range (and rage) at the extremes, almost screaming out for an over-the-top treatment, a level which the Wallonie scarcely rise to. And yet, somehow absolutely NONE of that matters: it all works together somehow to create a magical effect that, by the final curtain, had the audience keeping the artists returning for numerous calls. Young French tenor Sébastien Guèze has a beautiful tone, most impressive in his upper register, but his pitch seemed to be all over the place – several times making it difficult to tell what notes he was “supposed” to be singing. Still, the timbre is pleasing, he moves well and is boyishly handsome (right down to his ruddy cheeks – which make him look all of about 15). 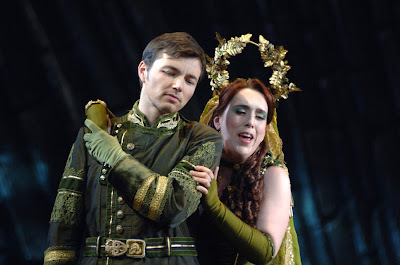 The evil knigh/prince, Karnak (he and his men in blinding/blazing, cardinal red uniforms) is swaggeringly sung by Belgian baritone Werner Van Mechelen. This is not an elegant voice and van Mechelen seems to be not a particularly good actor, but he made this part come across nicely. Eric Martin-Bonnet, (looking very much like Wallace Shawn) also more or less blasts his way through the role without offering much in the way of refinement, or beauty of tone, yet true to the spirit of the piece. To recap: there are a number of problems one might (and likely will) find problems with, but in the end, this is a production well worth experiencing, and – warts and all – makes as strong a case for Lalo’s opera as we can hope for.